If you thought coffee was all that there is to Starbucks, you’re probably wrong. With a number of mobile initiatives being brought out by the company, its name stands for much beyond espressos and lattes. Starbucks has been looking to carve out an identity in the area of digital innovation, and has done well so far. The Starbucks mobile app has accounted for about 26 million mobile payments since January. What is even more astounding is the fact that 6 million of those transactions have occurred in the past nine weeks, double of what the company got in the first nine weeks of the app’s release. 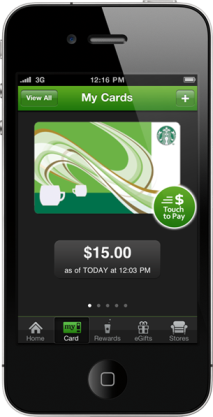 More and more customers are now opting for cashless transactions to pay for their coffee with the Starbucks mobile app. Already making its mark as the largest retail conglomerate using mobile payments, the Starbucks mobile pay is running successfully in North America. The mobile pay app was released in the US in January, through which customers can load money onto the Starbucks digital card and pay by scanning a 2D barcode at the outlet. Apart from the fact that customers clearly love the convenience of the Starbucks cards, they’re also making increasing use of the app’s e-gifting service to send Starbucks gifts from phones. Its success with mobile technology has prompted Starbucks to experiment with in-store experiences such as the Starbucks Cup Magic which adds a touch of augmented reality to the customers’ coffee experience. This feature has been used more than 450,000 times according to Adam Brotman, President and Manager of digital ventures at Starbucks. All these features have contributed to providing customers a complete mobile experience which has increased the coffee conglomerate’s brand value across the US and its prospects in the UK look even better with the app being released in the UK in January 2012.